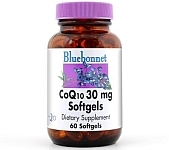 Bluebonnet’s CoQ10 30 mg Softgels provide the natural trans-isomer, yeast-fermented form of Ubiquinone that is identical to the body’s own CoQ10, which is imported from Japan, plus an equal amount of natural d-alpha tocopherol (vitamin E) in easy-to-swallow softgels for maximum assimilation and absorption. Directions: As a dietary supplement, take 1 softgel daily, preferably with a meal, or as directed by a healthcare practitioner. Other Ingredients: Gelatin, glycerin, water, rice bran oil, beta-carotene. Free Of: milk, egg, fish, crustacean shellfish, tree nuts, peanuts, wheat, corn, gluten, barley, sodium and sugar.